When Too Faced released their Sweet Peach eyeshadow palette a couple of years ago I was obsessed and it is still one of my most used palettes to date. 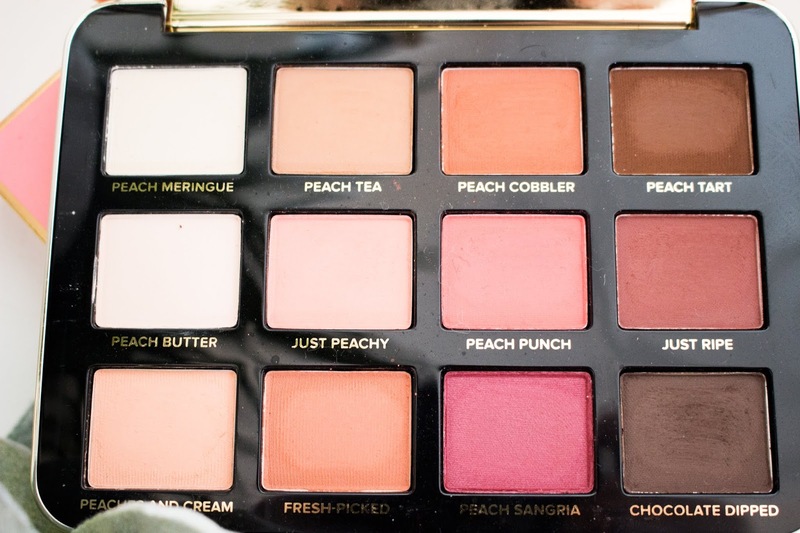 I love the scent, the shades and the formula of that palette. That palette is the only palette that I have hit pan on some of the shadows and I even purchased another one just in case it was to be discontinued at some point. 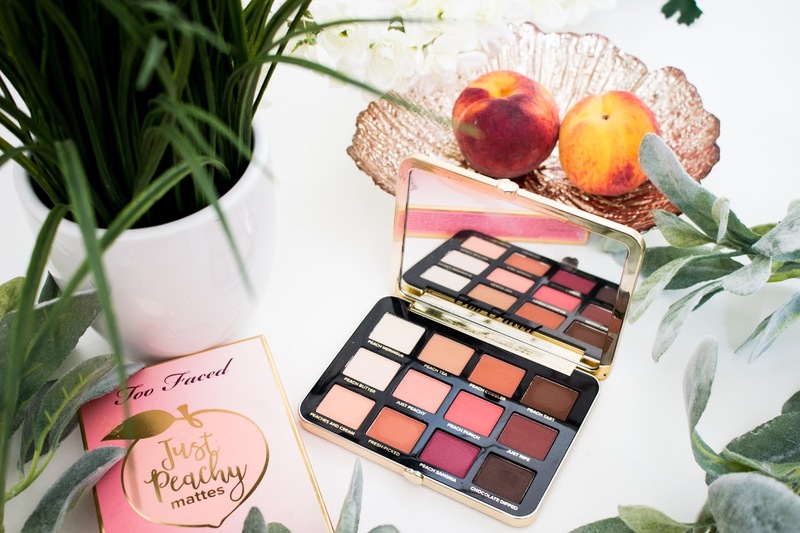 My only criticism of that palette was that there were not enough peach shades in it - so let me introduce you to its much more peachy sister palette ... the Just Peachy mattes eyeshadow palette! I have made it clear before that I am obsessed with packaging, but of course that should never be a reason to buy a product - however if the product is great, then it helps if the packaging is stunning too. The entire collection looks magnificent. Too Faced are well known for having the most beautiful packaging and it always shows in their collections. This collection really does stand out when you see it in stores of even just on your dressing table. It is also going to be in their permanent collection, along with the other products, meaning that you don't have to buy everything at once because its limited edition. You have time to buy the products when you want to. I feel like Too Faced really upped their game with this packaging. 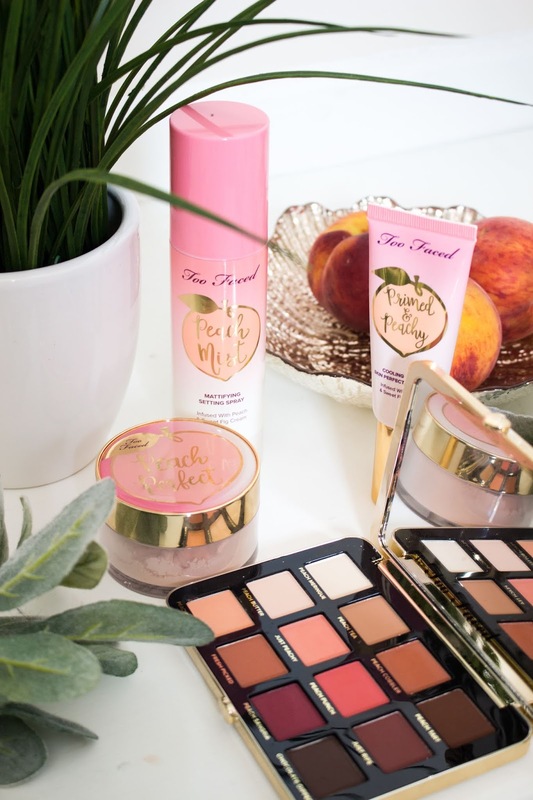 The ombre from peach to cream on all of the products just made it look really luxurious; especially as with some products Too Faced can make it look a bit childish. Whereas this is beautiful! I love the use of gold details around the edge of the palette and the gold peaches that act as a clasp to help you open the palette. It almost reminds me of the Becca x Chrissy Tiger face palette. The packaging just feels really sturdy and it has just been crafted beautifully and it looks like it should be so much more expensive. It has a huge mirror on the inside which is perfect for travelling with, plus it is a really great size (it's not too big but not too small). Also, it isn't really bulky so will be able to be taken abroad or just when travelling in general. So many details have been put into this palette, even down to the little peaches that act as a clasp. The palette open and closes magnetically, but it isn't going to open up in a makeup bag and go everywhere. The design is girly, adorable but still quite elegant and sophisticated. I also really appreciate that the shade names have been printed beneath each shadow as I am always losing the sheets of paper from other palettes. I just hope Too Faced can keep this standard of packaging up when it comes to future releases. By no means is this the newest palette from Too Faced but this is one of the newest ones in the last year that really appealed to me. I love any palette that has those warm toned shadows in them and this is a palette that I knew I would be purchasing. I know it may come as a surprise, but I do not own many eyeshadow palettes that have a lot of peach shades in them. It might not look like there are many peach shades in this palette, but there are a lot of shades in this palette that have peach undertones to them. 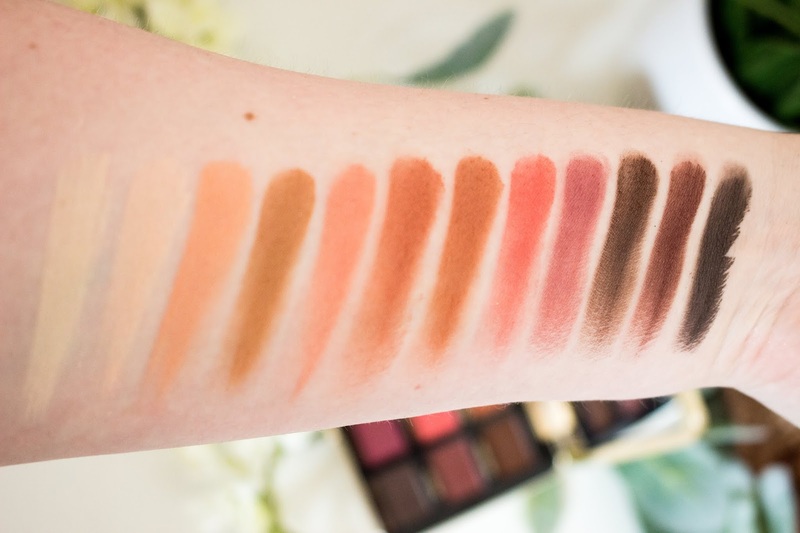 There are 12 shades in this palette that are all warm-toned - there are peaches, caramels, creams and deep chocolates, with a couple of berry/plum shades. All of the shadows in this palette are matte, with the exception of one, Peach Sangria, which has more of a pearl/satin finish. There is a strong scent with this whole collection. Every product in the Peaches and Cream collection has been infused with refreshing peach and sweet fig cream. I was such a huge fan of the scent that they had used in the Sweet Peach eyeshadow palette as it was more of a peach sweet scent, whereas this is more fig and peach. 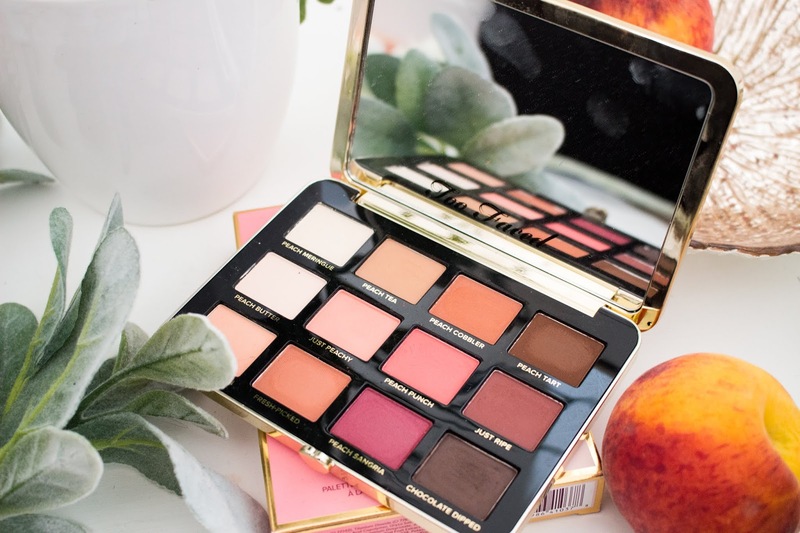 The scent with this palette is a lot stronger and quite intense than the original Sweet Peach palette. This could be a dealbreaker for some people who are sensitive to strong scents; however I can deal with the scent because it does not linger when you apply the eyeshadow and I don't often keep this open on my dressing table so I only smell it when I am using the palette. In comparison to other palettes from Too Faced, they have definitely stepped up their game when it comes to packaging and just the palette in general. I do feel like the formula is not identical to other shadows that they have created in the past. Initially these feel quite dry and stiff to the touch; however I found that was only with the initial layer and once you have used them a couple of times, they do become a lot softer although they don't have that buttery texture. They are so easy to work with, they are super pigmented, they are blendable and I found them to be really buildable. I did find some shadows were slightly more on the sheer side and could be patchy, however they all work well on the eyes, some shadows just need more work than others. I love the fact that these are all matte shades because that is what I tend to gravitate towards the most, especially during the day - I only tend to choose shimmer shadows when I am going out in the evening. Therefore, this palette is perfect for me and I can easily grab a shimmer shadow from another palette or use one of the Stila Magnificent Metals. I love how this compliments the Sweet Peach eyeshadow palette and I do sometimes use the shimmers from that palette with this one too. 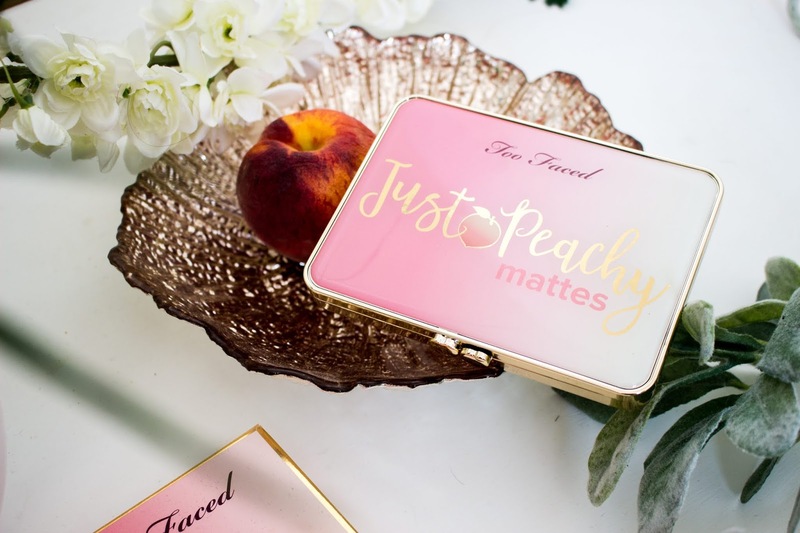 The Just Peachy Mattes eyeshadow palette is one of the newest palettes to be released by Too Faced in the last year. It has been sold in Sephora and on the Too Faced website since the Summer of 2017, but has only just been released in the UK, in Debenhams, in the middle of May 2018. This is a permanent collection in all of these stores. 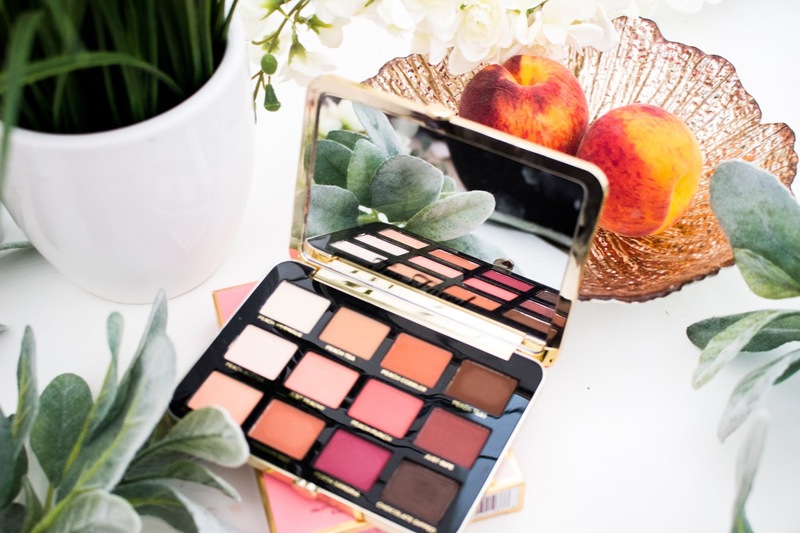 There are 12 matte shades that are a lot more peachy in tone that its predecessor (the Sweet Peach eyeshadow palette) and contains all matte shades, with the exception of Peach Sangria that has a more satin/pearl finish. It has a range of warm tones with peaches, caramels and rich chocolate browns. PEACH MERINGUE - a light ivory/warm beige with a subtle yellow undertone, with a matte finish. It does feel a bit dry in the pan, the first couple of times you use it, but after that it is really buttery and is perfect for setting your eyeshadow primer or concealer. PEACH BUTTER - a light warm cream/beige with pink/peachy undertones, with a matte finish. This is perfect for setting eyeshadow primers/concealers and is a lovely matte highlight shade that is easy to blend out. PEACHES AND CREAM - a light to medium peach shade with a matte finish. This is quite dry to start off with but after a few times using it, is becomes a lot softer. This is really opaque and blends beautifully as a warm transition shade for a peachy look. PEACH TEA - a light to medium warm caramel shade with a matte finish. This shade is beautiful on its own to create a pretty bronzed look and blends easily, as well as being super pigmented. JUST PEACHY - a bright warm peach with a matte finish. This is quite a sheer shade but can be built up, although it swatches better with a finger - I find that I like this shade all over the lid so sometimes I apply it with my finger and blend out the edges with a brush. FRESH-PICKED - a medium ginger/caramel shade with a matte finish. This is one of the smoothest shades in the palette and is beautiful for warming up the crease. It blends easily and is really pigmented. PEACH COBBLER - a warm burnt orange with a matte finish. This is a beautiful buttery shade the is super pigmented and blends effortlessly on the eye. PEACH PUNCH - a bright warm coral with peach undertones with a matte finish. I found that this shade was more on the sheer side, however it can be built up and is a really pretty shade. PEACH SANGRIA - a wine/berry shade with a red undertone to it with a pearl/satin finish. This is not really a matte shade, however it is not a full shimmer shade; instead it has more or a pearl finish to it with a pretty sheen. This is the hardest shade to us as it is quite sheer and would get patchy in some places. It is more of a subtle shade and is not as rich of a colour when applied to the eyes as it is in the palette. PEACH TART - a deep chocolate brown with a matte finish. This is quite a sheer formula, however it is easy to build up the pigmentation and blends beautiful to make an eye look, look more smokey. JUST RIPE - a spiced plum shade with reddish undertones and in a matte finish. This is quite dry when you use it and was quite patchy when I swatched it on my hand. However, when I used a brush it was not as patchy. It does apply quite well and is easy to build up the colour. CHOCOLATE DIPPED - a deep chocolate brown with a matte finish. This is an amazing shade and the pigmentation is so opaque. This is a shade that you only need a small amount of product on the brush to get a really pigmented look. It blends out beautifully but use it sparingly as it can be hard to blend out if you apply too much. I will admit, that these shadows are not the same as other shadows that Too Faced have formulated in the past. When you swatch them they do feel quite dry and stiff (they remind me of having a chalky texture rather than a smooth buttery finish). At first, I did think I was going to hate this palette because of how they felt but I was quickly proven wrong. The formula is more dry than usual, however they do get smoother once you have used them a few times and gotten that initial layer off. Also, they don't look or feel chalky when you apply them to the eyelids and working with them. I found that they were really easy to use and the shades were blendable and easy to build up. Some of the shadows are a bit sheer (and I have mentioned which ones above). Don't worry too much about this as I was able to build up the colour and pigmentation pretty easily with the more sheer shadows. There was also a couple that would first apply quite patchy, like Peach Sangria and Just Ripe, however you just have to apply a bit more shadow and that seems to fix the issue. Even though they felt chalky to touch, they don't have a chalky appearance on the eyes and they perform like a beautiful shadow, so I am not sure why they feel so dry in the pan. There is also very minimum kick-up in the pans and I didn't seem to notice any fallout when I applied my eyeshadow. The pigmentation of these shadows are reasonably good. Most of them are super pigmented and opaque, however there are some more sheer shadows. These aren't a big issue as it is easy to build up the shadow and I get a really beautiful, pigmented makeup look. I also love how easy these shadows are to blend as I can get a really soft look without having to blend too much with a brush. Some of the shadows don't swatch that well, but swatches should never be something that you rely on - they are more to see what the shades look like on your skin tone. Some shadows can swatch great and perform badly and then there are some that swatch badly but perform amazing. So don't focus too much on the swatches. I love the colour selection in this palette. There are so many peachy shades in the palette, and a lot have peachy undertones to them. I do wish that they had not included two creamy beige shades as I think they could have included a matte black or even another peach shade. The two beige shades do have different undertones to them but they don't really show up on my skin tone so I can only really use them to set my eyeshadow primer or concealer. Also some of the brown shades do look similar in the palette, and they do have different undertones where one is more of a plum but they are quite similar. However, I am a huge fan of the shades and they will look perfect to create some beautiful summer makeup looks. This palette is so versatile and I can create so many wearable makeup looks with this one palette that can be worn during the day and then transformed into a smokey eye for the evening, or I could just add some shimmer to make it really dramatic. I really think that this is a great palette for anyone who is knew to makeup as you can learn to build up colours and blend out shadows easily without worrying about messing up your makeup and having to start again. I do think that this is a palette where you need to wear an eyeshadow primer or concealer underneath. I have only worn this palette with a concealer on and the intensity of the shades and the blendability is so much easier when I have a primer on first. If you don't wear a primer then you may find it harder to build up the pigmentation, especially with some of those more sheer shades as they won't have anything to adhere to. I did notice that when I swatched them on my hand over no primer, the shadows would fade so quickly. One shade had almost vanished after half an hour, so you don't want that if you are going to be out all day and don't want to re-do your eye makeup. Whereas, over an eyeshadow primer, these shadows last eight hours before starting to fade slightly. Therefore, an eyeshadow primer or concealer is your best best for making your eyeshadow last all day and to make your eyes really pop! 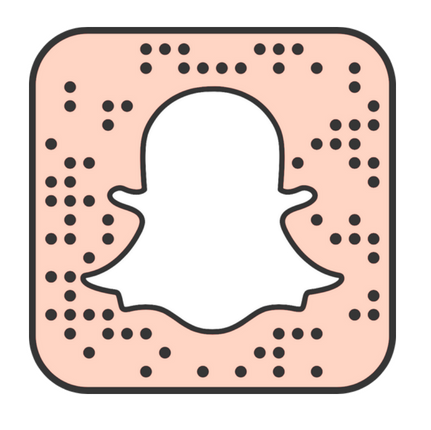 Whether this is worth buying is all down to you! Do you prefer mattes or shimmers? Now of course everyone needs matte eyeshadows in their collection for transition shades but not everyone can cope with an eyeshadow palette just full of mattes. I always find that all matte eye looks can either look really great or they can look so bad when I have done them. Plus if you were to make a mistake you can easily hide it with a shimmer shadow on top, whereas with this palette there is nowhere to hide. Of course you can apply a shimmer shadow over the top, but not everyone is going to own loads of palettes so this may not be possible. I think if you are looking to buy your first palette then this might not be the one for you as you would probably want a palette that has some shimmers in. However, if you are new to makeup and have a palette in your collection and you want to experiment with more matte shades then this is perfect. These shades are stunning for the summer months but can be worn all year round as well. 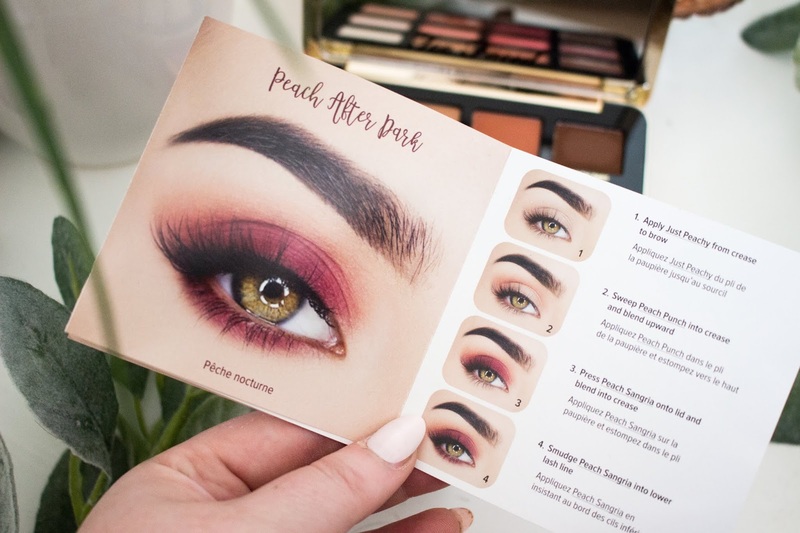 You also get a really handy leaflet with this palette (which I usually throw away but I kept this one) which tells you of different looks you can create with this palette to help get your started. I love this palette and even though some of the shadows are slightly sheer, they are easy to build up, have some great pigmentation and just blend effortlessly. This is a great product, you just sometimes have to put in more work with some of the shades (which I have already mentioned)! The Too Faced Just Peachy mattes eyeshadow palette retails for £33 and can be purchased from Debenhams, Sephora and Too Faced. Is this a palette that you would buy? Let me know in the comments if you are going to buy this palette and if you have already bought it, what do you think of it? Did it matter that the formula was a bit dry buy performed well?